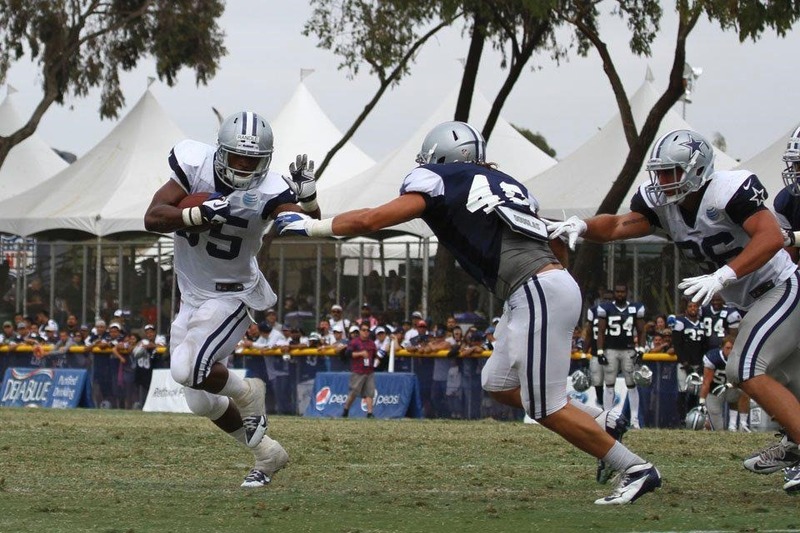 OXNARD, Calif. – The Dallas Cowboys got their first taste of real football since camp began with Sunday’s Blue and White Scrimmage, which featured a heavy dose of the team’s second and third teams competing against each other full speed. The backups and rookies had the opportunity today (Sunday) to stand out from the pack and make an impression with the team’s first scrimmage. Some took more advantage than others, with B.W. Webb returning an interception for a touchdown and quarterback Alex Tanney providing a spark for the backups. Perhaps the best news of the day was the lack of new injuries. Players were going full speed and some tackling occurred, although most whistles blew the play dead before a player could get dragged to the ground, particularly when the first team was on the field. No one appeared to head to the locker room for medical attention. The injured players who missed past practices didn’t return Sunday. The Cowboys were particularly short at receiver, as wide receivers Cole Beasley and Danny Coale were among the group of injured players off the field. Dez Bryant looked like he wanted to be on the field, but the coaches and trainers elected to hold him out as well for precautionary reasons. Before the scrimmage began, the team still participated in team drills. One of the standout plays was a play-action pass to Jason Witten on the first play of red zone drills, going for a touchdown. “It’s an area of the field we want to attack,” Witten said. “I think we can do a better job of that. It’s good to see it paying off for us right now. Some of those play-action fakes, Tony does such a good job of drawing those backers up. Lance Dunbar had a couple nice runs and continued to demonstrate his quickness as an asset not only as a receiver out of the backfield, but between the tackles as well for a change of pace from DeMarco Murray. 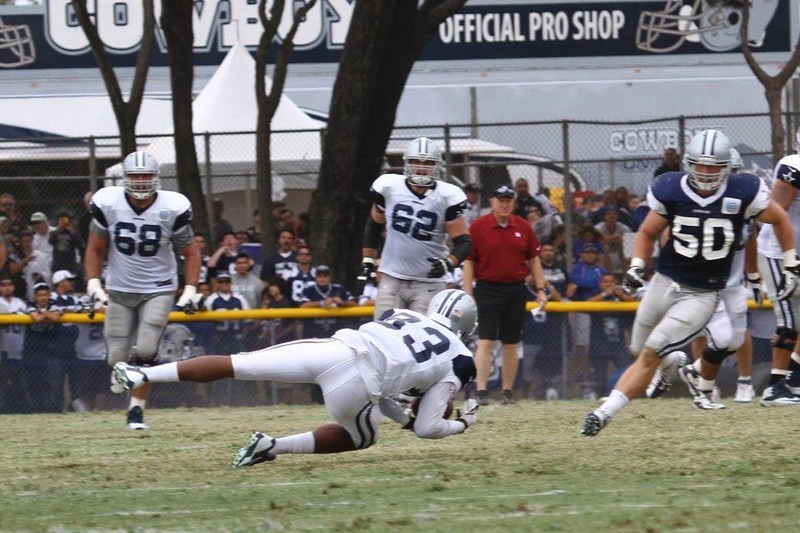 Later on as the scrimmage began, Joseph Randle also displayed what the Cowboys hoped he would. After recovering in the offseason, the scrimmage gave Randle an opportunity to take more snaps in live situations. He took advantage of those, demonstrating a cut move that left a coupled defenders grasping for a jersey. The Dallas Cowboys coaches tried to make the scrimmage as much like a game as possible, keeping a scoreboard and forcing the offense to move the chains. The defense was also allowed to be more physical than they usually are during camp. The lack of receivers meant the ones that were out there got an extended look with the second and third teams. Jared Green and Tim Benford each got a heavy dose of playing time with the backups. Green made a nice play in 7-on-7 before the scrimmage and continued being a prime target to move down the field for Tanney and Nick Stephens. Green and Benford had a couple miscues, but they also helped move the chains and stood out on multiple occasions. Eric Rogers (14) continued to turn some heads with one of the plays of the day, hauling in a deep heave to the back of the end zone from Tanney with two defenders covering him. The play may have been called back for a sack, but the defense didn’t stop playing and neither did the receiver. Jason Hatcher unleashed some competitive fire when he drew an offside flag during the scrimmage. After arguing with the officials to no avail, he returned to the huddle in a bad mood. Several plays later, he blew up the line of scrimmage and sacked Tony Romo uncontested. 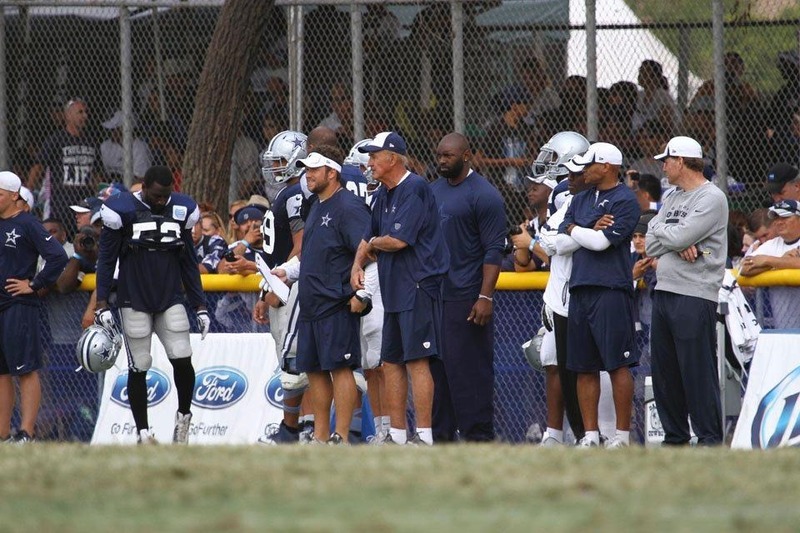 Head athletic trainer Jim Maurer said it appeared the Cowboys made it through the scrimmage without any injuries. While Maurer is always cautious of players popping into the training room with an injury, he said overall, the team seemed to make it through pretty clean. In Austin’s return to practice after his veteran off day, he caught a touchdown from Romo during team drills in a bunch formation on a quick out near the goal line. The Cowboys worked on situational drills after special teams and team drills, but before the scrimmage. There’s been a heavy focus on red zone drills thus far in camp, and they worked on red zone and two-minute situations. 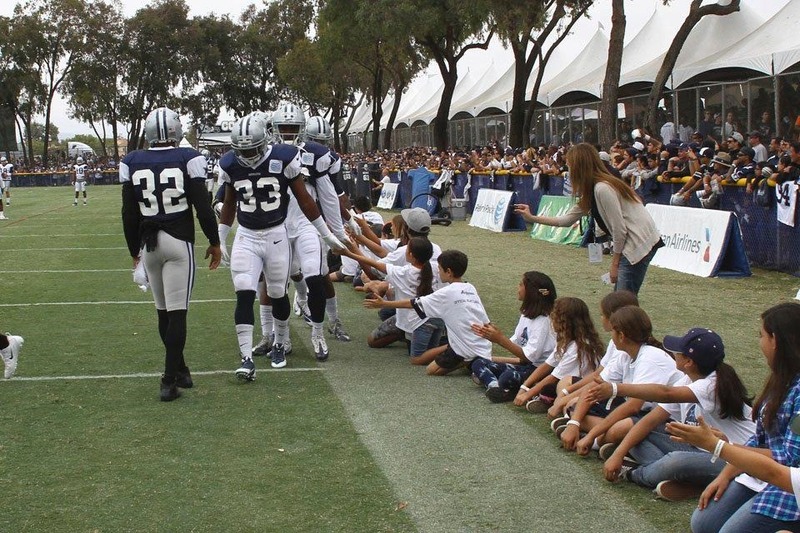 The scrimmage brought out the largest attendance of the training camp so far in Oxnard with an estimated 8,479 fans jammed along the sidelines and end zone. Joseph Randle: The Cowboys’ newest running back had his most extensive workload of training camp, and he showed some of the promise the team saw in him during the draft. 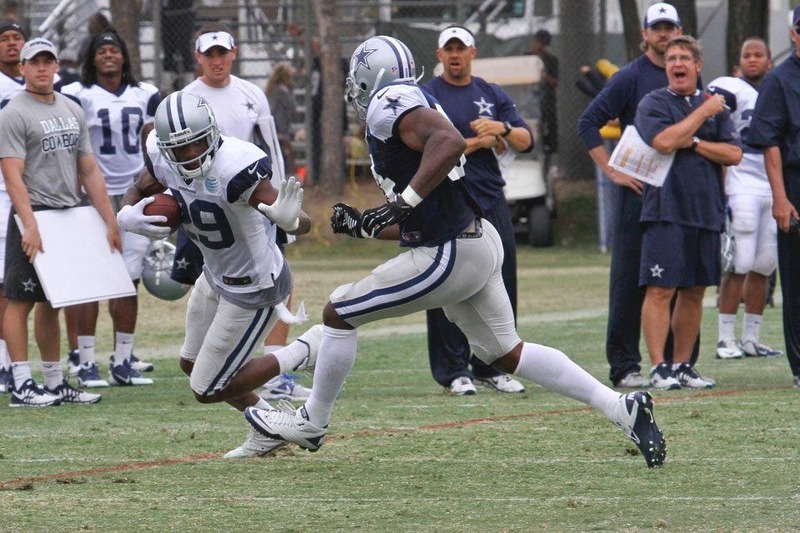 Randle split second-team carries with Lance Dunbar. He got plenty of carries, but he also had a chance to showcase his hands coming out of the backfield. During the full-contact portion of the scrimmage, he displayed his strength in warding off tacklers. “This is the most reps I’ve got since I’ve been a Cowboy, so it felt good,” Randle said. Alex Tanney: Tanney wasn’t even signed until the Dallas Cowboys got to Oxnard, but he’s wasted no time in capturing the imaginations of onlookers. The 25-year-old displays good accuracy and a live arm, and he has a knack for creating plays. Tanney and Stephens split time as third-team quarterback. During the scrimmage, Tanney broke out of the pocket and connected with wide receiver Eric Rogers on an impressive deep ball, though he was technically “sacked” on the play. It’s hard to count that, though, considering it was a mere slap on the back. Andre Smith: The second-year tight end out of Virginia Tech has been one of the most-forgotten participants in this training camp – not necessarily because he’s bad, but because of the depth the Cowboys possess at tight end. Smith showed some of his ability when given a chance during the scrimmage, as he made several nice catches and showed good moves with the ball in his hand. Smith caught a crossing route from Orton and outran two linebackers to the sideline. As he neared the end zone, safety J.J. Wilcox laid an upper body hit on Smith shoulder pads, only to see the big tight end bounce off and keep moving. B.W. Webb might have been the Cowboys rookie to make the smallest impression during the first week of training camp – until Sunday, at least. Webb grabbed a spot as a second-team cornerback during the end-of-practice scrimmage, and he used the opportunity to make the most memorable play of the afternoon. Second-team quarterback Kyle Orton was looking for wide receiver Tim Benford on a short slant to his left, but Webb intervened. The rookie stepped in front of the route and picked it off, racing past the offense for a 50-yard touchdown. Webb was mobbed in the end zone by safeties Matt Johnson and J.J. Wilcox, and as he returned the ball to the sideline, many of the defensive veterans swarmed him to congratulate him on his first big play. July 21 – Signed T Demetress Bell, QB Alex Tanney and Lavasier Tuinei. Placed G Mackenzy Bernadeau and DT Jay Ratliff on the active/physically unable to perform list and placed the following players on the active/non-football injury list: T Demetress Bell, C/G Ryan Cook, LS Louis-Philippe Ladouceur, G Ronald Leary, G Nate Livings and WR Lavasier Tuinei. July 23 – C/G Ryan Cook passed his physical and returned to practice. July 24 – Released WR Lavasier Tuinei. Signed DT Landon Cohen and DE George Selvie. July 26 – G Nate Livings passed his physical and returned to practice.